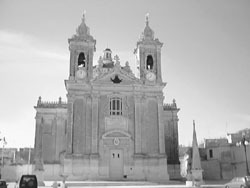 Information: Lija became a parish on the 6 February 1594 and a hundred years later the present church was built; it was dedicated by Bishop Labini on the 25th July 1782. Other information on churches under this parish: Church of the Blessed Virgin "Tal-Mirakli" The church, which is within the limits of the parish of Lija, is not far away from the road which from Attard leads to Mosta, and is a very well-known sanctuary. The present church was built in 1664 and dedicated in 1787. Tradition holds that the image of the Virgin venerated in the church shed a tear when a severe earthquake hit the island. Marriages may be celebrated in the church. Dedication date 23 December 1787 Priest in charge Parish Priest Address: Kappella Madonna tal-Mirakli, Triq Annibale Preca, Lija LJA 1911 Telephone: 21437282 For Bookings: 21442553 Holy Masses Sundays and feast days: 08.15, 09.30 am From Monday to Saturday: 05.30 pm The old Church of the Transfiguration The church was the parish church of Lija before the present church was built. Today it is used for religious exhibitions and meetings. St. Andrew's Church This was the first church to be built in Lija; it was rebuilt in 1624 and today it is used as a centre for youths. St. Mary's Church The chapel was built in 1569 and rebuilt a century later; it is open from Monday to Friday, 8.00am to 8.00pm, for a perpetual adoration. Church of the Nativity of the Virgin Mary The church was built in 1600; today it is kept closed. Church dedicated to St. Peter The church was built towards the beginning of the 16th Century. The Archbishop handed it over to the Dominican Sisters where they opened their first home in Malta. Holy Mass Daily at 06.30 am. Church of the Immaculate Conception The church was built in 1647 and is part of an ecclesiastical benefice.